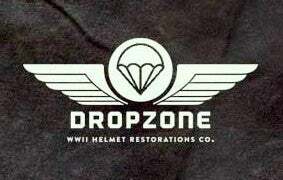 Dropzone Helmet Restorations Co. — Replica Hawley M-1 helmet liner. U.S. Army Infantry. HBT Webbing & Rayon Nape. Replica Hawley M-1 helmet liner. U.S. Army Infantry. HBT Webbing & Rayon Nape. REPLICA M-1 HAWLEY HELMET LINER. For sale is one HBT webbed replica Hawley M1 Liner. Excellent HBT webbing, steel A-washers, fixed liner strap which is riveted in place, HBT adjustable sweatband & nape strap. The rim & outer cloth cover have been aged/weathered while the inside is nice & clean. Ready for your Fixed Bale to display or if you do USMC Reenacting, this is perfect for a Guadalcanal, New Britain, Peleliu and Tarawa. North Africa & Italy too!! Properly stamped: LINER FIBRE M-1 (G) inside.